(Section Headings): The Components. Engineering Foods. Information and Documentation. Index. 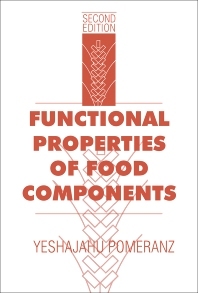 An extensive revision of the 1985 first edition, this volume combines the biochemistry and functionality of all food components. It provides broad coverage and specific descriptions of selected, major foods, as well as such elements as biotechnology-engineered foods and food patents. While directed toward food technologists and nutritionists, the contents are also invaluable to biologists, engineers, and economists in agriculture, food production, and food processing.